When traffic is heavy and driving is stop and go, it can seem as though the exhaust of every vehicle on the road has found its way into your vehicle. Fortunately, automobile manufacturers have added cabin air filters in most makes and models. 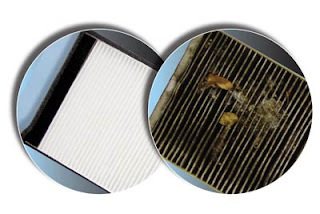 These filters, much like the furnace or air conditioning filters found in most homes, can significantly reduce the amount of allergens, carbon monoxide, and other dangerous contaminants that enter your vehicle. For a driver, breathing these types of pollutants can be unpleasant but can also be dangerous, especially for young children, senior citizens and those with asthma, allergies, respiratory problems or weakened pulmonary systems. The U.S. Car Care Council says these types of contaminants can be six times more concentrated in a car than outside the vehicle, a troubling fact if you are among the 50 million people in the U.S. who suffer from allergies and respiratory problems. According to Ramon Nunez, director of filter product management for Purolator automotive filters, cabin air filters typically contain an electrostatically charged micro-fiber material capable of trapping particles such as pollen, dust, mold spores, soot, smog, fungus, mildew, tobacco smoke and other particulates before they enter a vehicle. Many cabin air filters also include an activated carbon layer for filtering out noxious gases and odors. Once found only in high-end European cars, Nunez says cabin air filters are now used in about 62 million vehicles in operation in the United States and will be standard equipment in about 67 percent of new vehicles sold in the U.S. in 2006. Most 2001 or later model vehicles have cabin air filters. A physician who specializes in treating allergies and respiratory ailments says the increased use of cabin air filters in vehicles is a positive and healthy trend. "It's really a matter of common sense," says James L. Sublett, M.D., a board certified allergist and managing partner of the Louisville, Ky. - based Family Allergy and Asthma. "If we're concerned about the quality of air in our homes, we should be equally or more concerned about the air we're breathing in our vehicles." That's because pollen, dust, molds and other particulates that trigger allergy, asthma and other respiratory related symptoms almost always originate outdoors, Dr. Sublett says. "These particulates are generally under 10 micrometers in size, which can very easily enter the respiratory system," he notes. "Automotive cabin air filters are designed to trap items of this size very effectively and keep them away from the passenger environment." To find out how much impact a cabin air filter can really have, Purolator commissioned an independent air sampling study comparing the carbon monoxide and mold spore levels in two same-class mid-size sedans. One vehicle came equipped with a cabin air filter and one did not. The two vehicles were driven for just two hours in rush-hour traffic around Nashville, Tenn. - considered one of the worst U.S. cities for allergy sufferers. Results showed that the car without a cabin air filter had more than eight times the carbon monoxide levels and more than 40% greater concentration of mold spores inside the cabin than the vehicle with a cabin air filter. Motorists should expect a cabin air filter to provide similar results with pollen, dust, bacteria and other pollutants, says Nunez. As for breathing exhaust fumes, gasses and odors, Dr. Sublett says the health benefits of a cabin air filter preventing their entry into a vehicle, "goes without saying. Carbon monoxide and carbon dioxide, which are everywhere outside as a result of engine combustion, are poisonous substances that can cause headaches and irritate the eyes, nose and respiratory system. Diesel exhaust particulates are also known to trigger allergy and asthma responses", he added. The majority of car owners, however, are unaware that cabin air filters exist or that their vehicle may have one since it may not be mentioned in the owner's manual. If you don't know if your vehicle has a cabin air filter or don't remember when it was last changed, ask us to check it out during your next visit. It should be replaced at least once year or more based on your driving habits and health concerns. Replacing it will take between 15 and 60 minutes depending on your vehicle's make and model.